The Queensland Parks and Wildlife Service has commenced a trial to track dingoes (that have shown aggressive behaviour) through the use of tracking and high visibility collars. It is anticipated that the information derived from the tracking collars will provide a better understanding of specific dingoes’ movements, which will better inform which risk intervention measures are most suitable for specific circumstances. The collars are a lightweight design for wildlife management and do not impede the dingo in any way. They can be released automatically from the animal at any time and can also be programmed to release after a selected period of time. 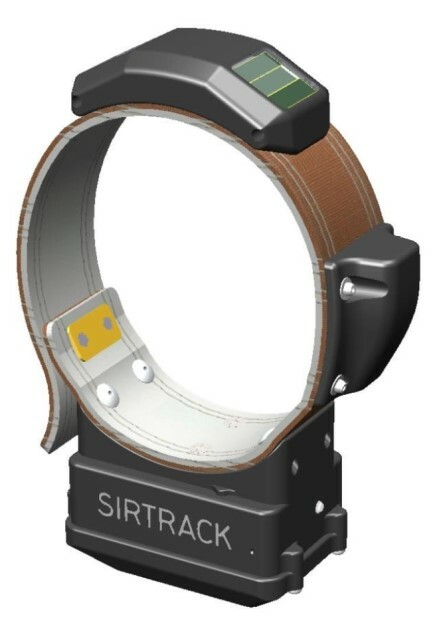 Both the tracking and high-visibility collars will also allow people to more easily recognise high-risk animals. 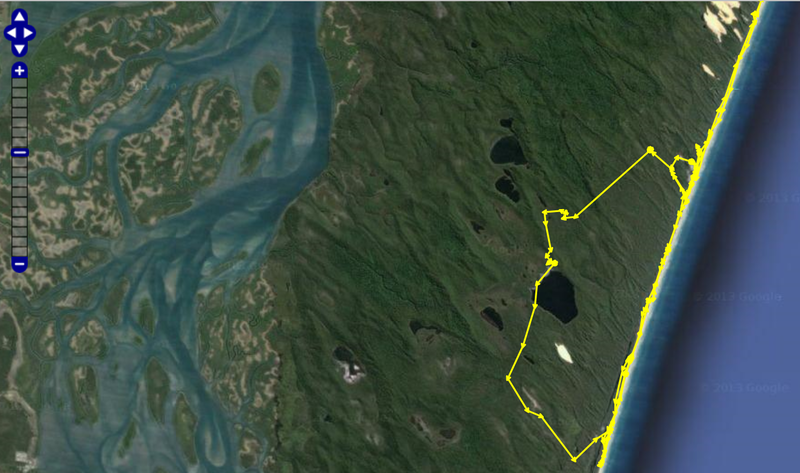 Movement patterns of a dingo fitted with a satellite tracking collar over a four-day period. Managing dingo conservation and visitor safety on the island includes a range of intervention techniques, with the use of tracking and high-visibility collars enhancing the current program. Their introduction is anticipated to reduce risk to human safety and boost dingo welfare by assisting in preventing the animals’ behaviour escalating to the point that humane destruction is a necessary management option. AJEM Special Issue, ‘Future of an icon’, now available! In our last FINIA newsletter, we introduced a new paper on Fraser Island, published by the Australian Journal of Environmental Management (AJEM). This paper was one of eight comprising a then-forthcoming special issue: Future of an Icon: K’gari-Fraser Island, climate change and social expectations. This special issue is now out! In addition to covering diverse topics—dingo conservation, the dingo as an icon, the impact of tourism representation on opportunities for the Butchulla people, the impact of camping on water quality, the implications of past environmental change for the future of K’gari-Fraser Island, spatial databases for research and management, cultural philosophy, and the kind of icon that K’gari-Fraser should be—this special issue has been recognised for its valuable scholarly contribution, with three papers having been long-listed, and one proceeding to the short-list, for AJEM’s annual best paper award. The rationale for this special issue lies in the pressure K’gari-Fraser Island is under in a changing global environment. The unique hydrologic and vegetation environments of K’gari-Fraser Island were driven by succession, fire and climatic change during the accumulated evolution of a series of 100-thousand-year cycles. The future of K’gari-Fraser Island is subject to significant changes in the way it is valued as a result of World Heritage listing, and increasingly as a tourism resource rather than a conservation asset. These global social and environmental changes have implications for how planning for policy and management must emerge. International obligations under the World Heritage Convention can only be met if the island is protected from destructive influences. Current state-based resourcing and policy meets state government policy priorities. However, it is federal obligations for Australia’s responsibilities under the global Convention that will protect the World Heritage values. Changes in the legal basis for management are needed to reflect the importance of World Heritage listing. clear articulation of the values and purposes of World Heritage listing for management and monitoring to reduce the impact of people by applying robust and defensible measurements of the extent, severity and duration of environmental harm caused to species, ecosystems and physical values by human activities. Australasian Journal of Environmental Management, Special Issue, Vol. 22, No. 2, 2015. One of the papers in this Special Issue has been short-listed and two additional papers were longlisted for the annual best paper award. “GUEST EDITORIAL Future of an icon: K’gari-Fraser Island, climate change and social expectations”: FREE DOWNLOAD: http://www.tandfonline.com/eprint/49ERURYi7RBCxUMnnuuQ/full. K’gari-Fraser Island is under pressure in a changing global environment. The unique hydrologic and vegetation environments of K’gari-Fraser Island were driven by succession, fire and climatic change during the accumulated evolution of a series of 100-thousand-year cycles. The future of K’gari-Fraser Island is subject to significant changes in the way it is valued as a result of World Heritage listing, and increasingly as a tourism resource rather than a conservation asset. These global social and environmental changes have implications for the way in which planning for policy and management must emerge. The quality of WH landscapes has important consequences for the health of people, communities, and in turn, for the natural environment. WH listed sites, such as K’gari-Fraser Island, provide unique cross-cultural and global connections between people and landscapes, and Australia’s economic and social stability guarantees the kind of governance that affords responsibility for WH values. Australian dingoes are threatened by interbreeding with domestic dogs. As a refuge from further interbreeding, the conservation significance of dingoes on Fraser Island is unquestioned. However, some dingoes presenting genuine human safety risks are humanely destroyed. In this study, we explore the potential effects of this on the sustainability of the island’s dingo population. Dingo abundance was 76–171 adult individuals during the mating (pre-whelping) season of 2012. A total of 110 dingoes were destroyed between 2001 and 2013. Approximately 66% of known-age dingoes destroyed were <18 months old and 65% of known-gender dingoes destroyed were male. In any given year, no more than four female dingoes of any age were destroyed during dingoes’ annual mating and whelping seasons. On only one occasion was an adult (and subordinate) female dingo destroyed during this period. Available data therefore indicate that the spatially and temporally variable removal of so few female and/or adult animals from a population of this size is highly unlikely to have adverse effects on dingo population growth rates or breeding success. Adverse effects of humane destructions might be expected to increase if a substantially greater proportion of adult and/or female dingoes are targeted for destruction in the future. “Representations of the dingo: contextualising iconicity”: http://www.tandfonline.com/doi/full/10.1080/14486563.2014.985268. Iconic species can present particular political and management imperatives and often shape national identities, and are shaped by them. More importantly, in the case of K’gari-Fraser Island and the dingo, shape the perceptions of iconicity in that landscape. Iconic species are used to represent diverse human valuing such as commercial, recreational, national, conservation and cultural. The dingo is contested as an introduced species in social evolution, is identified as a pest animal in contemporary land management, raises ancient human fears of predation and is, at the same time, the iconic representative of a World Heritage Listed landscape, due partly to the alleged genetic purity of K’gari-Fraser Island dingoes. Iconic species are viewed differently depending on epistemological biases and disciplinary frameworks, but these multiple constructions are rarely acknowledged or articulated. This paper searches for commonalities in constructions of the dingo across three literatures: scientific, anthropological/cultural analyses and tourism geographies. We find that each of these disciplinary literatures is divided. Within this contestation the dingo remains a liminal being in human perception defined by a predominantly anthropocentric vision. But there are two participants in any gaze, and future research might seek to understand how the dingo looks back at humans. “Representation of Butchulla cultural heritage values in communication of K’gari (Fraser Island) as a tourism destination”: http://www.tandfonline.com/doi/full/10.1080/14486563.2014.985266#abstract. K’gari is a popular international tourism destination, having gained World Heritage (WH) status for its natural values. In spite of the local indigenous population, the Butchulla, having clear aspirations for its management, indigenous cultural heritage values have yet to be recognised in the listing. This project examined the degree to which indigenous values are visible in the promotion of K’gari as a tourism destination, through content and image analysis. The study found a lack of representation of indigenous culture in tourism marketing material. This acts to marginalise indigenous values and misses the opportunity to share a rich history, makes indigenous perspectives visible for visitors and provides a different perspective to the values for which WH status is nominated. The research provides recommendations about promoting indigenous cultural values in tourism and a future review of K’gari’s WH status, as well as recommendations for further research. Concern for the maintenance of water quality of the lakes on K’gari-Fraser Island has attracted research attention but the impact of beach camping on beach freshwater has been poorly considered. The assumption has been that the natural assimilative capacity of the foredune ecosystem is sufficient to dissipate any negative environmental impact. An exploratory study of nutrients, faecal coliforms and faecal sterols in the watertable and beach flows associated with camping and non-camping zones reveals concerning differences between sample sites. The study suggests nutrient levels in the watertable are enriched in camping zones and that, in some areas, faecal coliforms persist in beach flows. The link to a human cause is supported by the presence of strong faecal sterol signals in soil samples from the watertable interface. The risk implications for human health are significant although the biological impact implications remain unexplored. The unique combination of landscapes and processes that are present and operate on Fraser Island (K’gari) create a dynamic setting that is capable of recording past environmental events, climate variations and former landscapes. Likewise, its geographic position makes Fraser Island sensitive to those events and processes. Based on optically stimulated luminescence dating, the records archived within the world’s largest sand island span a period that has the potential to exceed 750 ka and contain specific records that are of extremely high resolution over the past 40,000 years. This is due to the geographic position of Fraser Island, which lies in the coastal subtropical region of Queensland Australia. Fraser Island is exposed to the open ocean currents of the Coral Sea on the east coast and the waters of Hervey Bay on its western margin and is positioned to receive moisture from the Indo-Australian monsoon, southeast trade winds and experiences occasional tropical and ex-tropical cyclones. We review literature that presents the current level of understanding of sea level change, ecological variation and environmental change on Fraser Island. The previous works illustrate the importance of Fraser Island and may link processes, environments and climates on Fraser Island with global records. K’gari-Fraser Island, the world’s largest barrier sand island, is at the crossroads of World Heritage status, due to destructive environmental use in concert with climate change. Will K’gari-Fraser Island exemplify innovative, adaptive management or become just another degraded recreational facility? We synthesize the likely impact of human pressures and predicted consequences on the values of this island. World-renown natural beauty and ongoing biological and geological processes in coastal, wetland, heathland and rainforest environments, all contribute to its World Heritage status. The impact of hundreds of thousands of annual visitors is increasing on the island’s biodiversity, cultural connections, ecological functions and environmental values. Maintaining World Heritage values will necessitate the re-framing of values to integrate socioeconomic factors in management and reduce extractive forms of tourism. Environmentally sound, systematic conservation planning that achieves social equity is urgently needed to rectify historical mistakes and update current management practices. Characterizing and sustaining biological refugia will be important to retain biodiversity in areas that are less visited. The development of a coherent approach to interpretation concerning history, access and values is required to encourage a more sympathetic use of this World Heritage environment. Alternatively, ongoing attrition of the island’s values by increased levels of destructive use is inevitable. A small, multidisciplinary project in the disciplines of environmental humanities, environmental sociology, communication, geography and geo-spatial science has just been funded by DSTIA. A recent study lead by Ozgun Emre Can from Oxford University may provide some invaluable lessons on reducing dingo-human conflict on Fraser Island. The study which focuses on bears suggests a number of interventions that can be used by land managers.